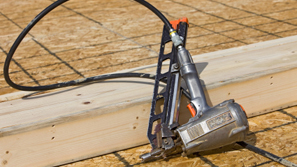 Nail guns – also known as pneumatic nailers – have become one of the most popular tools for homeowners as well as commercial and residential construction contractors. Nail guns also are among the most deadly tools on the market, with more than 40,000 people – both nail gun users and bystanders – suffering serious puncture wounds and related injuries each year. The result of nail gun injuries may be severe tissue and nerve damage, an increased risk of infection, and even death. The attorneys at The Law Offices of Frank L. Branson stand ready to require responsibility from nail gun manufacturers and compensation for the victims of their defective and dangerous products. We have experience in successfully representing individuals and families against powerful corporations, including nail gun manufacturers. The firm uses the latest high-tech presentations to demonstrate the flaws of defective products and the trauma that results in order to build a compelling case for jurors. To learn more about our experience in defective nail gun related matters, we invite you to contact the firm here.